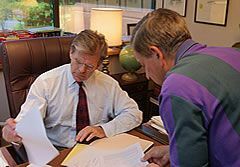 Credit Fraud and Identity Theft Attorneys in Richmond | The Consumer Law Group, P.C. Have You Been the Victim of Credit Fraud or Identity Theft? Our Attorneys Can Help. Convenience defines our times. As the technology age has bloomed, U.S. consumers have experienced this more and more, particularly in the many ways consumers can spend money today. In the banking and finance industries, going to the bank is now just one alternative, and rarely a necessity. Financial institutions have spent many millions in the past 10 years to implement automated systems that allow their customers to bank and borrow remotely and securely. Through the use of increasingly “smart” credit cards, debit cards, ATM cards and other forms of electronic commerce and transactions, most of us have 24 hour access to our money, without ever requiring any personal contact with our banks, credit unions or other financial institutions. But in this new era of online purchases, ATMs, and auto-debits, the question remains—who else has access to our money? Last November, more than 30,000 consumers across the nation discovered that in Bay Shore, New York, a young man working at the help desk of a credit technology company had enough access to their confidential financial records to collectively cost them in excess of $4 million. With easy access to the major credit reporting agencies, the man was able to generate credit reports of random consumers and then sell them to criminals, who would exploit the information to perpetrate credit card fraud and identity theft. Beyond the millions of dollars lost, thousands of these consumers went through the fear and uncertainty of losing control of their financial lives to identity theft. With their social security numbers, credit card numbers and other vital financial information unknowingly in the hands of career criminals, the financial status of many consumers was damaged or ruined. Investigation into the full extent of the damage caused by this massive case of credit fraud is expected to go on for several years. While incidents of credit fraud on the scale of the help desk employee case are rare, individual cases of credit card fraud and other forms of credit fraud happen on a daily basis. Increasingly, the culprits are not the traditional thief, purse snatcher, or pick pocket, but a banking insider working either as an employee or a contractor for a financial institution. This insider will take secure information about banking customers and then either use that information for his own gain or sell that information to criminals who proceed to drain a victim’s finances as quickly and completely as possible. These criminals are good at what they do, and often have the ability to delay detection for weeks and months before a consumer becomes aware that they have become victims of credit fraud. The blame for these types of credit fraud incidents often involves not only the bank employee, but the bank or financial institution itself. Above all other purposes, a bank is there to ensure that your money is secure. When banking security cannot keep up with criminal cunning and a bank employee violates a consumer’s trust through illegal activity, the consumer needs an attorney to seek legal recourse and financial compensation against the responsible parties whose security lapses allowed this to happen. The Consumer Law Group offers legal representation and assistance to victims of credit fraud, credit card fraud, identity theft and other types of consumer fraud. We help our credit fraud clients cope with the difficult aftermath of credit fraud, and offer guidance and support in helping you get your credit and good name on two feet again. Contact us today. You can read more here about how to obtain credit report information and review frequently asked questions about your credit standing. We also provide links to sites that provide helpful tips on the latest Internet scams (dot-cons) and how to protect and maintain your consumer rights through the Federal Trade Commission FTC. ?What is the most effective way to dispute an error on my credit report? ?What do I do about judgments on my credit report that I know nothing about? ?What is the Fair Credit Reporting Act?